How does a TFAW subscription work? Subscriptions are a great way to automatically purchase items every month. It's somewhat like a magazine subscription, but better in several respects. If you're familiar with pre-ordering unreleased products, you can think of subscriptions as pre-orders on auto-pilot. Subscriptions are pulled for customers based on the original solicitation date of each issue, which is typically 2-3 months in advance of the release date. Since subscriptions will begin with the current month's solicited issue, you may need to manually pre-order the earlier issues that have already passed their subscription deadline to ensure that you receive all issues. Because it's impossible to predict what combination of ordered products will be available for a particular shipment, we do require that you keep a valid credit card or debit card on file for subscriptions. Each time a shipment is ready, we will charge your credit card. Log into your existing account. If you don't have an account with TFAW.com, you will need to create one. If you have previously placed an order with TFAW.com, you should already have an account. Once you have logged into your account, click the "Subscriptions" link. 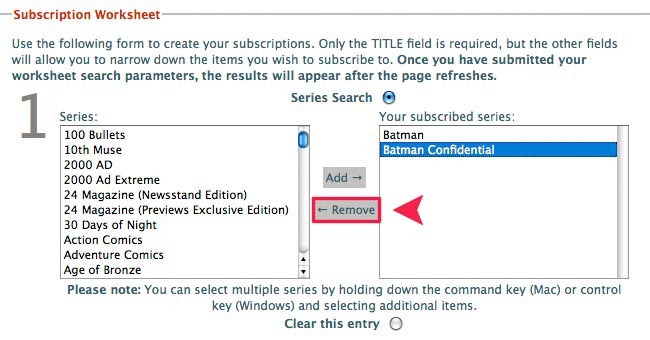 You will then see your Subscription Worksheet page, where you can either subscribe to specific comic series or enter search terms and parameters to manage other subscriptions not in the series list. Submit the worksheet and follow the instructions to confirm your selections and set your order frequency (weekly/bi-monthly/monthly). These settings will then be saved in your account. You can modify your subscription settings at any time. Around the beginning of each month we add the new Diamond products to the website and compare this new catalog to your subscription settings. Any matching items will be automatically added to your order for that month, and you will receive an email containing this prospective list of products. You have until the end of the month to add, modify, or remove items from this list. Near the end of the month, you will receive another email showing the list of products we will be ordering on your behalf. If you missed or forgot the first notification, you still have a few more days to modify your subscription items before we finalize your order. A few days later, we commit your order and send it on to our distributor. At this point, your order is considered firm and is not refundable. When we receive the items from our distributors, your order will be processed, your credit card charged, and your package shipped using the shipping method specified in your account. Where can I find step-by-step "how to" instructions for setting up a subscription? Please click here for a detailed guide on how to set up subscriptions. How is a subscription different from a pre-order? A subscription is an ongoing service. You choose the items you want to subscribe to once and we will order those items every time a new issue in the series becomes available. Pre-ordering means that you are only ordering one item once. For example, if you subscribe to the current issue of Superman, you will receive every issue of Superman that comes out in the future (until you cancel your subscription). If you pre-order the current issue of Superman, you will only get that single issue that you pre-order, but not any future issues. Searching for subscription items is easy. When you're on the Subscriptions Worksheet page, the #1 section is the Series Search portion of the worksheet. This tool is for those who want to subscribe to one or more specific comic book series. This will subscribe you to only comic or graphic novels that are part of a series. If you want to broaden your subscription to potentially include toys, apparel or collectibles from your favorite series, then you should use the keyword search instead. The keyword search is great if you're looking to broaden your subscription (for example, you want to subscribe to anything that has to do with Spider-Man, not just a specific comic) then #2 - #4 on the subscription worksheet are for you. Title contains these words - enter a word or phrase to search for, i.e. "spider-man", "star wars republic", or "x-men"
but not these words - words to exclude, i.e. "sensational", "knights", or "uncanny"
With these controls, you can easily build a custom subscription that will automatically order all Spider-Man graphic novels under $20 that are not in the "Sensational Spider-Man" series (for example). To order both Spider-Man graphic novels and comics, you would need two separate keyword searches (one for comics and another for graphic novels). Once you have entered one or more keyword searches, press the "Submit Worksheet" button at the bottom of the page to see ALL matching items available in the current catalog. IMPORTANT: Be aware that even if your search doesn't turn up any results, this search will still be saved in your account and may match one or more products in the future. Every month we automatically subscribe you to new merchandise based on the searches in your account. A Spider-Man graphic novel may not come out this month but you are still "subscribed". When a matching product is added to the catalog, it will be added to your monthly order and you will be charged for it. We will send two e-mail messages to you each month before finalizing your order with our distributor. Thus, it is extremely important that you have a valid e-mail account, that it will consistently accept email from tfaw.com (watch those spam filters), and is checked frequently by you! You may log into your account at any time to edit your subscriptions. However, you are responsible to pay for subscription items that have already been ordered on your behalf. Due to the nature of the direct comic book market, comic shops (including TFAW.com) must send firm order numbers for comics and merchandise three months in advance of the actual street date. Our distributor also does not allow merchandise returns, so it's quite important that customers follow through on their subscription and preorder commitments. For example, if you are subscribed to The Uncanny X-Men in April, the first issue of your subscription will arrive in June. If in October you decide to cancel your subscription, we will have already ordered the issues shipping in October, November and potentially December. You will be responsible for paying for those issues since we ordered them at your request. If the subscription you are canceling is a title subscription from "Worksheet 1" all you need to do is highlight the title and click the "Remove" button, then scroll to the bottom of the subscription page and click the "Submit Worksheet" button. To cancel a key-word based subscription from one of the other worksheets all you need to do is click the "Clear this Entry" button and then scroll to the bottom of the page and click the "Submit Worksheet ' button. If you have already pre-ordered a specific item, it will not show up on your subscription worksheet. For example, if you pre-ordered "Adventures of Superman #500" and you have a keyword search for "Adventures Superman", issue #500 will not appear on your worksheet (because you've already pre-ordered it separately). You will, however, receive issue #501 the next month and subsequent issues in the following months. Can I subscribe to movies? Sorry, we don't currently offer subscriptions to DVD movies. We only offer subscriptions for products offered in the Diamond Previews catalog. Legal Notice: Entire contents trademarked (® or TM) and copyrighted (©) 1986-2019 by Things From Another World, Inc. and respective copyright and trademark holders. All rights reserved. Page rendered at 2019-04-19 17:33:39 in 0.183 seconds.